A stretcher is used to carry patients while transportation. Ambulance stretchers are used in an ambulance for the transportation of a patient; either for emergency or non-emergency transport. These stretchers are also called ambulance trolleys; they may be manual, pneumatic or electric in nature. Manual stretchers are the ones that require a paramedic to handle and operate. These include the mechanical auto loading stretchers, which are not powered. Pneumatic stretchers are also known as hydraulic stretchers. The movement of these stretchers is controlled by a hydraulic mechanism attached to it. These stretchers may also be hybrid type that have a hydraulic mechanism, which is battery powered. The electric stretchers need battery power for the functioning of the mechanics of the stretcher. In developed regions such as the U.S., U.K., Germany and Australia, pneumatic and electric powered stretchers are rapidly replacing the manual stretchers. However, in low-income countries manual stretchers are generally used due to their low price and ease of availability. PMR estimates that the global market for ambulance stretchers is expected to surpass US$ 264.8 Mn by 2026 end, expanding at a CAGR of 2–3% over 2018–2026. The emergency stretchers is expected to be the dominant segment in the global ambulance stretchers market in 2017. Asia Pacific is expected to expand at a high CAGR of above 2% over the forecast period. The global ambulance stretchers market is expected to be driven by increasing ageing population, increased government spending on healthcare, growing medical tourism, and rising awareness among general public about emergency services. The growing number of road accidents, especially in the APAC region, along with increasing global prevalence of cardio vascular diseases is expected to increase the adoption of emergency services. In most of the regions across the world the number of ambulances on an average is higher than the minimum required, however the distribution of ambulances geographically is highly uneven. This is the major factor driving the demand for ambulance services in rural and densely populated regions, which in turn is driving the growth of the global ambulance stretchers market. 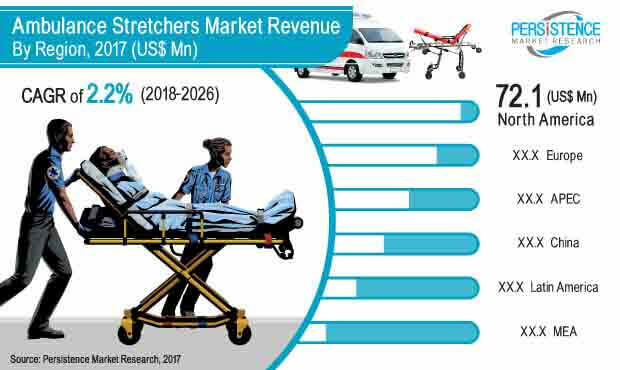 Furthermore, factors such as high cost of ambulance services and lack of skilled professionals in the emergency services are expected to hamper the growth of the global ambulance stretchers market. The global market for ambulance stretchers is segmented in to six key regions viz. North America, Latin America, Europe, Asia Pacific except China (APEC), China and the Middle East and Africa (MEA). North America accounted a leading share in 2017, followed by Europe and Asia Pacific. The North America ambulance stretchers market is foreseen to lose its share to Asia Pacific, partly due to presence of large number of local manufacturers of ambulance stretchers in the Asia Pacific region. Thus, the ambulance stretchers market in the Asia Pacific has a strong growth during the forecasted period. China, being one of the most populated regions in the world, has one of the high aged population and it is grow steadily. The increasing ageing population in the region is expected to drive the growth of the ambulance stretchers market in the region. Examples of some of the key players identified in the global ambulance stretchers market include Stryker Corporation, Ferno-Washington Inc., Omega Surgical, Zhangjiagang New Fellow Med Co.,Ltd., Dragon Industry(ZJG) Co., Ltd, Narang Medical Limited, Jiangsu Rixin Medical Equipment Co., Ltd. and Jiangsu Saikang Medical Equipment Co. Ltd. With over 13% value share, Stryker Corporation dominates the global market for ambulance stretchers. Jiangsu Saikang Medical Equipment Co. Ltd.